As Nation Mourns 9 Black Victims of Church Massacre, Details of Suspect’s White Supremacy Emerge | Democracy Now! A 21-year-old South Carolina man with apparent sympathies to white supremacy has been arrested for the massacre at the Emanuel African Methodist Episcopal Church in Charleston, South Carolina. Dylann Roof reportedly sat with the church members for an hour before before he opened fire. Roof’s capture came as the names of the nine slain African-American churchgoers were released. The Department of Justice is investigating Wednesday’s attack as a hate crime, motivated by racism or other prejudice. 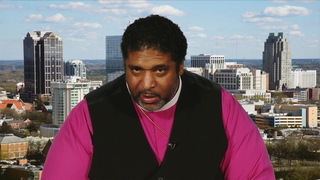 JUAN GONZÁLEZ: We turn now to the massacre in Charleston, South Carolina, where nine clergy and parishioners were shot dead Wednesday while participating in a Bible study in one of the most historic black churches in the South. On Thursday, we learned the names of the nine victims. The church’s pastor, 41-year-old Reverend Clementa Pinckney, a state senator, at the age of 23 he became the youngest African American to be elected to the state Legislature. He was elected to the state Senate at age 27. AMY GOODMAN: Sharonda Coleman-Singleton was a 45-year-old mother of three, reverend and high school track coach. JUAN GONZÁLEZ: Cynthia Hurd was a 54-year-old librarian. She was the manager at St. Andrews Regional Library since 2011. AMY GOODMAN: Daniel Simmons was a 74-year-old ministry staff member at Emanuel AME and the former pastor of Greater Zion AME Church in the nearby town of Awendaw. JUAN GONZÁLEZ: Myra Thompson was the wife of the Reverend Anthony Thompson of Charleston’s Holy Trinity REC Church. AMY GOODMAN: The Reverend Depayne Middleton-Doctor was a 49-year-old mother of four. JUAN GONZÁLEZ: Ethel Lance was a 70-year-old grandmother who had worked at Emanuel AME for more than three decades. AMY GOODMAN: Susie Jackson was Ethel Lance’s cousin and the oldest victim of the massacre at the age of 87. She was a longtime member of the church. JUAN GONZÁLEZ: Susie Jackson’s nephew, Tywanza Sanders, was the youngest victim at 26 years old. He was a recent graduate of Allen University in Columbia, South Carolina. He graduated from the university’s Division of Business Administration. Before the shooting took place, Tywanza posted a short video clip on Snapchat, where you can briefly see the suspected gunman, Dylann Roof, sitting at a table with all of the victims during the Bible study. Roof reportedly sat with the church members for an hour before he opened fire. Sylvia Johnson, the cousin of slain pastor Clementa Pinckney, said a survivor described to her what happened inside the church. SYLVIA JOHNSON: From my understanding, the suspect came to the church, and he asked for the pastor: “Where is the pastor?” They showed him where the pastor was. He sat next to my cousin, Reverend Clementa Pinckney, for throughout the entire Bible study. At the conclusion of the Bible study, from what I understand, they just start hearing loud noises just ringing out. And he had already wounded—the suspect had already wounded a couple of individuals, including my cousin, Reverend Clementa Pinckney. AMY GOODMAN: Sylvia Johnson also recounted what she had been told by the survivor of the assailant’s motives. The Department of Justice is investigating Wednesday’s attack as a hate crime, motivated by racism or other prejudice. President Obama addressed the nation on Thursday and spoke of the significance of the Emanuel African Methodist Episcopal Church. PRESIDENT BARACK OBAMA: There is something particularly heartbreaking about a death happening in a place in which we seek solace and we seek peace, in a place of worship. Mother Emanuel is, in fact, more than a church. This is a place of worship that was founded by African Americans seeking liberty. This is a church that was burned to the ground because it’s worshipers worked to end slavery. When there were laws banning all black church gatherings, they conducted services in secret. When there was a nonviolent movement to bring our country closer in line with our highest ideals, some of our brightest leaders spoke and led marches from this church’s steps. This is a sacred place in the history of Charleston and in the history of America. AMY GOODMAN: In a moment, we’ll be joined by two leaders of two of the most prominent black churches in the country. We’ll also discuss the issue of why so many are afraid to use the word “domestic terrorism.” Then we’ll talk about gun control in the United States. Stay with us.